Our pick as the best available junior Bible for children aged 6-12. Our pick as the best available junior Bible. 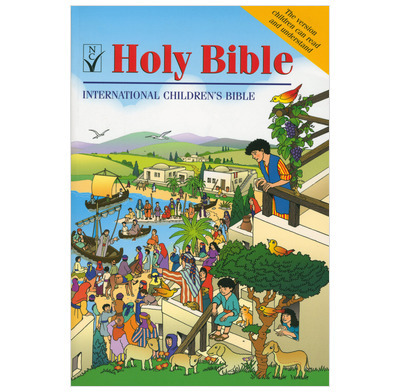 The International Children's Bible is not an adult Bible especially packaged for children. It has been translated directly from the original texts into English that can be read and understood by children aged between 6 and 12. It has large easy-to-read type in two columns; short sentences and simple, modern vocabulary; over 40 pages of maps and illustrations and a dictionary. Download our type-size guide to check which font size is right for you. Very happy with my purchase. Bought for my 9yr old son. A very child appropriate version of the adult bible. I enjoy it myself. Very happy! Thank you, Good book co.! I have bought this bible as present for an 8 year old. He absolutely loves it. Easy to read and understand, attractive design! Absolutely great and highly recommended. Very quick delivery and great service!! Would buy from again. I bought the Bible for a new Christian lady mid 40's who found even a Good News Bible too difficult to read - is loving this one. I think this translation is the best modern one yet for it is not a paraphrase but a trabpnslation. I have been using this bible since I got my first copy as a seven-year old, in 1994. When I got saved, officially, my interest in it renewed, and I started re-studying it at 16 years of age. Now, I am 27 and I use it along with other more advanced bibles to really translate the essence of what it is the Word is saying to me as adult and to me as child. I then use it, alongside the NIV and ESV to teach my Children's Church Monthly Memory Verse. On a more personal level, it helps me to relax from the intellectual rigours of trying to understand the complicated language of some translations, by it's simplicity. In my bookcase - definitely a favourite! I recently bought this for the 10 year old daughter of a friend of mine, and was pleased to see when visiting today that she is still reading it! It is good to have a full translation of the Bible which appeals to children. The illustrations are very good. I have also used it as a teacher - again it is good for children to get some sense of the whole book, rather than just having Bible Stories - however well re-told. We have been given a Bible each in our Sunday school group. I like the front cover because it is very colourful and shows a lot of detail. It is also easy to read for children my age (I'm nearly 8) and my sister is 12 and she likes it too. Since we were given these Bibles we use them a lot more in our groups. I like reading it and I have one at home too. We were looking for a 'proper' Bible for our 8 year old daughter. This one was recommended, and we haven't been disappointed. The pictures are great and help to bridge the gap from the children's Bibles she's been used to, but now she is able to get to grips with the names of the different books, finding chapters and verses. She's downstairs every morning for her Bible study time before school, using the TOPZ notes in addition. I teach preschoolers in the Awana Cubbies program. I prefer to read the passage straight from the Bible and the power of the Word of God speak for Itself. This version works for us! I need to make very few explanations after reading this version.